Georgia State, Here I Come (on MARTA)! It’s official — I’m a graduate student seeking a Masters of Arts in Teaching Secondary Mathematics. This week, I registered at Georgia State for the Spring semester and plotted the next 15-odd months of my education. My goal, since starting teaching, has been to get certified. If school goes as planned, I’ll be holding a Masters-level certificate for the state of Georgia in May 2009! Georgia State is located in downtown Atlanta and I live in the northern suburbs. Atlanta traffic is horrible, so getting downtown for night classes could have been a challenge. Fortunately, I live and work about a mile from access to MARTA, our transit system. I’m taking James up on his challenge to reduce the number of cars on Atlanta’s roads. 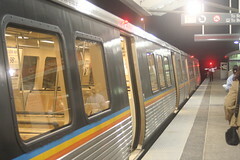 I’ll be riding MARTA to school, as I did this week to my advisement meeting (when I snapped this photo). This entry was posted in gradschool. Bookmark the permalink. Good for you. Going to graduate school part-time is not easy but generally is worth the effort. One of the great things is for students to see that teachers keep going back to school as students. It sets a great example that education is worth the effort. Best of luck to you!